One of the most emotional days in cricket history, as South Africa played their first international match for 21 years, against India in Calcutta. Global opposition to apartheid had seen South African cricket ostracised since they beat Australia in 1969-70, but four months after rejoining the ICC they began a speedily arranged tour with this one-dayer. India's victory was more comfortable than the three-wicket margin suggested, despite Allan Donald announcing himself to the world with 5 for 29. Defeat hardly mattered, though, and South Africa's captain Clive Rice, whose three matches on this short tour were his only official internationals, summed up everyone's feelings when he said, "I know how Neil Armstrong felt when he stood on the moon." Bangladesh became the tenth member to join cricket's top table when they began their inaugural Test against India in Dhaka, and for three days they acquitted themselves admirably. Aminul Islam's nine-hour 145 helped them to 400, and they would probably have taken a first-innings lead but for a seventh-wicket stand of 121 between Sourav Ganguly (84) and Sunil Joshi (92). But facing a deficit of only 29, Bangladesh fell apart. They were skittled for 91 and India motored to a nine-wicket victory off the last ball of the fourth day. 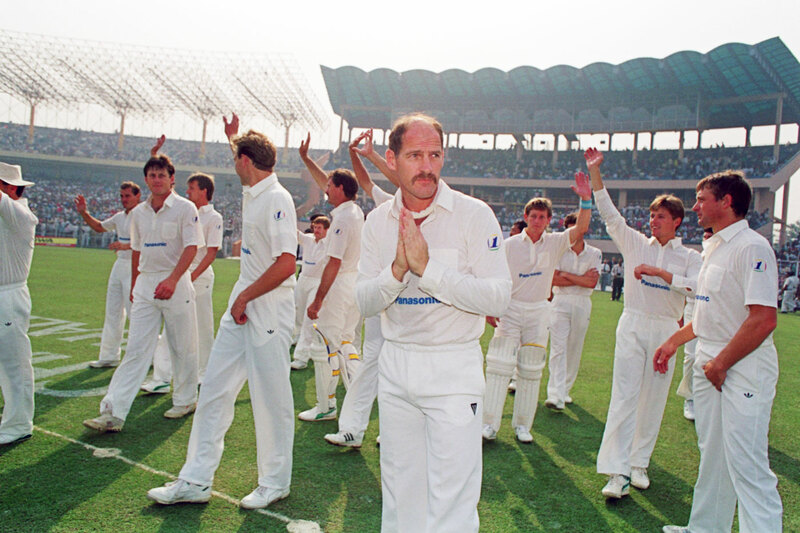 Amazingly, it was only India's second victory in 50 overseas Tests, going back to 1986. An average of 47 from 29 Tests proves that Seymour Nurse, who was born today, was right out of the top drawer. He was a middle-order stroke-maker from Barbados who didn't really establish himself until the 1966 West Indies tour of England, when he was 32. Nurse then passed 50 five times in as many Tests, and though he hammered 137 at Headingley, his best innings probably came at Trent Bridge, where he thumped a majestic 93 in trying circumstances. He was a Wisden Cricketer of the Year in 1967, and finished his Test career with a magnificent 258 in Christchurch in 1968-69. The fastest hundred for a South African batsman, in Cape Town. Jimmy Sinclair took out the frustration of impending defeat in the third Test to Australia by slamming a century in just 80 minutes, including six sixes. Sinclair had made a century in the previous match, in Johannesburg, too, but that game ended like this one, in defeat. Here South Africa followed on after being skittled for 85, and despite Sinclair's assault they were only able to set Australia a measly victory target of 59 - which was chased down in less than ten overs. Shai Hope was born this day in Barbados, and 21 years later made his West Indies Test debut as a highly regarded young talent. Two years on, he made the world sit up when he became the first player ever in first-class cricket to score two centuries at Headingley, setting up a storied Test win for West Indies, who had been thrashed by an innings in the previous match of the series. Few would have fancied being an Australian batsman in the first Test against West Indies, as Malcolm Marshall, Joel Garner, Michael Holding and Courtney Walsh eyed up a damp, uneven Perth surface with a score of 416 to defend. The Aussies were duly blown away in less than two hours for 76, with Holding taking 6 for 21. The bowling was frightening, the catching brilliant, and the Wisden Almanack said West Indies were "irresistible". Australia made a better fist of things second time round - even Terry Alderman managed 23 - but they were only delaying the inevitable, and West Indies wrapped up an innings victory with a day to spare. It was their ninth win in a row, a record that they would extend to 11 and which would last until Australia turned the tables and surpassed it by hammering West Indies in 2000-01. Wisden called Nasser Hussain's decision to put Australia in on the first morning of the Ashes in Brisbane "one of the costliest decisions in Test history". Considering England lost by 384 runs, it was hardly an exaggeration. Matthew Hayden fell three short of a double-century in the first innings - while adding 272 with Ricky Ponting (123) - and scored 103 in the second. After conceding a first-innings lead of 167, England were set to chase 464 in less than a day. They were bowled out for 79. Australia won the series 4-1. The only excuse Hussain had for the loss was the horrific injury to Simon Jones on the first day. Aftab Ahmed, who was born today, first came to the attention of the Bangladesh selectors when he scored 79 against South Africa in the Under-19 World Cup in 2002, and the following year he was included in the Test squad to face England. Known more as a one-day dasher, he played 14 Tests and 80 ODIs, most notably finishing off Bangladesh's historic one-day win over Australia in Cardiff by smashing Jason Gillespie for a four and six. A handy bowler, his one-day best of 5 for 31 came against New Zealand in November 2004. A remarkable batting performance gave Australia a six-wicket victory over Pakistan in the third one-dayer in Lahore. For the first time, four batsmen made hundreds in an ODI: Ijaz Ahmed and Yousuf Youhana for Pakistan, and Adam Gilchrist and Ricky Ponting for the Aussies. Pakistan made 315 for 8, but Australia overhauled that with chilling efficiency, sealing victory with seven balls to spare. In the process they equalled the highest score at the time to win a one-dayer batting second: India made 316 for 7, also against Pakistan, in Dhaka in 1997-98.